Remove the lid use a fork to remove the chicken out of the slow cooker. And add in tortellini and spinach, Parmesan cheese and warmed cream (cream should be warmed because it may cause curdling if added in cold). On a cutting board, shred or cut the chicken into bite-size pieces. Add the chicken back into the slow cooker. Put the lid back on and cook on HIGH for about 10 more minutes, or until the tortellini are cooked through. Ladle into serving bowls and enjoy! 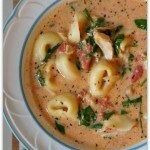 *I used my 6 quart oval slow cooker for this recipe.